A lively community differentiates a mediocre website from an excellent one. There are many factors that contribute to a thriving WordPress community. Recent comments widgets enable the WordPress websites to open a platform for visitors to comment, interact and ask queries. So, here in our today’s post we have compiled a list of cool free WordPress recent comments widgets for your WordPress blogs. The widgets that we will list today will enable to convert your WordPress website into one of the best community and interactivity platform. Don’t forget to subscribe to our RSS-feed and follow us on Twitter and Facebook for recent updates. You may be interested in the following posts: Free Boxed WordPress Themes 2015, Free Playlists Widgets for WordPress, Premium Lifestyle WordPress Themes and Free WordPress Facebook Sidebar Plugins. Provides handful of Widgets and a backend to supercharge your site. Display your bio/site info on your site. Display the most recent comments. Display your latest Instagram photos on your site. Display the blog posts with Thumbnail. Includes Recent Posts, Random Posts, Sticky Posts and Related Posts. This is a widget that let you show the latest comments from your WordPress Blog in a Sidebar area with comments author’s avatars. Clean design makes it easy to fit in any kind of look of WordPress themes. Show chosen number of recent comments from your blog with author’s avatars. This plugin adds a link at the end of the comment actions row (the links for the comment that become visible under the comment when you hover over the comment). The “Show more” link, when clicked, will replace the excerpt with the full comment. The full comment will include all markup, including originally utilized markup and changes applied via filters, plugins, etc. 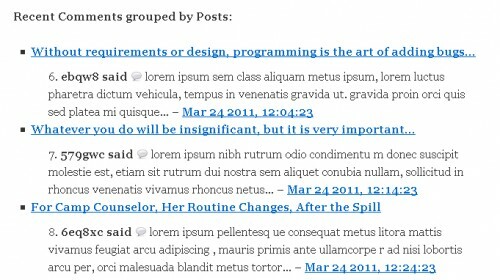 This is a simple popular posts WordPress widget for your blog. Add and day interval to specify when the posts are considered popular, the default is 365 (one year) you can also filter your post by category. If you want to show comments along with their author’s avatars and an excerpt of their comment, then this is the right plugin for you. And it’s not limited to just a widget showing recent comments: The plugin provides configurable widgets, shortcodes and an API to display comments in sensible ways, including author avatars, links, comment excerpts. Show an excerpt or the full comment. You can choose to not show the comment as well. Display recent comments in sidebar with user avatar/ gravatar support styles, information, active scrollbar when you have so much comments. 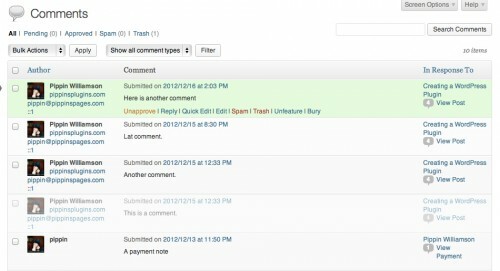 Add Disqus top commenters widget to your WordPress with our user-friendly plugin. Just install the plugin to your WordPress and visit Widget settings in Appearance menu to add our widget to your blog. Advanced Widget Pack plugin comprises of six widgets: Author Details, Author List, Popular Posts, Featured Posts, Recent Comments and recent Posts. Author Details: This widget displays author gravatar and allows you to align the gravatar to left or right. It also allows you to display author description which is already given by the user in his profile or you can add custom description. Lets the admin add “featured” or “buried” css class to selected comments. Handy to highlight comments that add value to your post. This plugin makes use of the meta_query option added in WordPress 3.5 to the WP_Comment_Query class, so it is no longer compatible with earlier versions of WordPress. This plugin displays recent comment lists at assigned locations. It does not add any significant load to your website. The comment list is updated on the fly when a visitor adds a comment or when you moderate one. No additional queries are needed for end-users. A recent comment list, in my opinion, can help stimulate discussion and exploration of your blog tremendously. The worst thing is Get Recent Comment doesn’t seem to be updated anymore. Why Should You Moderate Your Blog Comments?